Developer Aone Chen out of China has released utility for creating your own Firemonkey style theme. The utility is built in Firemonkey and allows you to preview the theme within it. The utility can load both style files and binary style files. The built in color adjuster within the utility allows you to create a new style for any of the platforms supported by FMX which are Android, IOS, OSX, and Windows. Once you create a new style you can apply the color filter and then save the style out for usage in your own app. The utility supports the various different screen resolution ratioswhich are listed as 1, 1.5, 2, and 3. The blog post about the utility is in Chinese so be sure to use a translator if you need more information about the utility. The utility is free but source code for it is not included. The style files should also work with C++Builder. Try this style utility with the Premium Styles too. 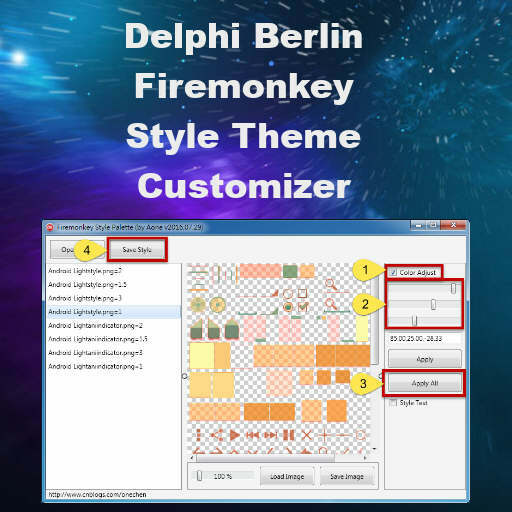 Head over and download the Firemonkey theme utility for Delphi 10 Berlin. Mirror: Download the theme utility directly from this mirror.